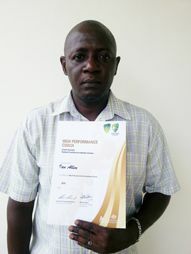 This, after completing a five-day cricket coaching course in Fort Lauderdale, Florida in 2012. Conducted by Cricket Australia, the course was a high performance national coaching scheme and was both theoretical and practical and was mainly elite players focussed. âIt means a lot to me especially in this competitive avenue of coaching ,knowing that I will be more marketable and also the players whom I am involved with can have the opportunity to be exposed to the coaching that can assist them in their overall development,â Allen told SEARCHLIGHT.